For those in police and other law enforcement professions, having the right equipment is vital to the success of your job. Most city and county governments as well as security firms allow the police, sheriff’s department, and guards to purchase their own equipment. One device that should be part of your everyday work is the tactical police flashlight. While standard flashlights have their uses, the tactical flashlight offers more options for those in law enforcement and security. For starters, this type of flashlight has different settings for emitting light which can be used in different situations. Read more about top 10 tactical flashlights in 2016 for police and law enforcement personnel. 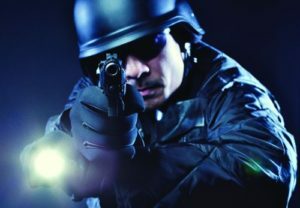 There are times in which the use of deadly force is necessary, but in many cases the police and security guards want non-lethal options for dealing with suspects and intruders who may be unarmed, but still dangerous. In addition, many police and security guards are called to the scene of an emergency where breaking a window is necessary. It is these situations where a police tactical flashlight offers considerable advantages. For those who are interested in purchasing this type of flashlight, there are four crucial features for your law enforcement and security needs. The best flashlight for law enforcement will have a blinding light that puts out at least 130 lumens and preferably more. By temporarily blinding the suspect, you now have the time to take further action to render them helpless. In addition, the hard casing which should be crafted from aluminum and perhaps hard polymers should also have the ability to break glass or be used as a weapon if needed. Finally, having a flashing or pulsing light can attract the attention of others and bring them to your position in case you are in need of assistance. Naturally, you will also want a tactical flashlight to have a low setting of 5 to 15 lumens so that you can successfully navigate in the darkness. Less important, but worth considering if you use night vision equipment is having a flashlight lens with a red filter so the light does not interfere with your equipment. You should review the requirements of your position to see what other features will come in handy for your tactical flashlight. Having a tactical law enforcement flashlight at your disposal provides you with more options that can become quite useful in a number of situations. From navigating in the dark to breaking glass in order to free a trapped person from a vehicle to temporarily blinding a potential assailant, the tactical flashlight offers a number of excellent uses that should be on your belt. In addition, you can find a number of these flashlights marked at reasonable prices which makes them a must-have for your law enforcement or security needs. To have a good tactical flashlight at your side is not only a vast improvement over a standard flashlight as it provides you with more choices when facing a myriad of situations. How (Ways) A Tactical Flashlight Could Save Your Life?